At Greaves, we love to hear stories of our clients’ travels in India. In this feature, Mr. and Mrs. Ogden describe their wonderful experience visiting South India on our Saffron & Sandalwood Tour. 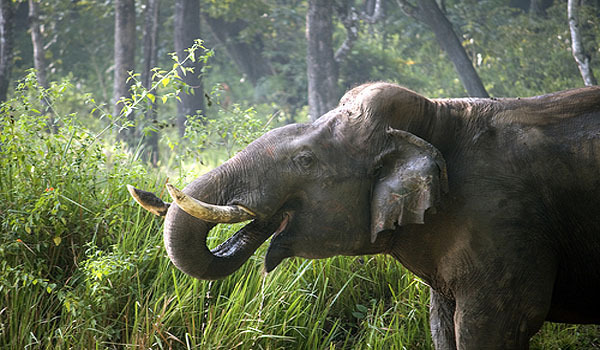 From the temples of Madurai to the elephants of Nagarhole National Park, read on for their first-hand account of their travels. 1. Have you travelled in India previously? If so, where did you visit, and how long was your stay? We have been to India three times now. The first trip was an 11-night tour of Delhi, Agra, Orcha, Khajuraho, Bandavgarh, and then back to Khajurho and Delhi. The second trip was a two-week tour of Kerala. Thirdly, we took a two-week tour of Rajasthan, visiting Bharatpur, Jaipur, Jodphur, Jaisalmer, Kumbalgarh and Udaipur. This was our fourth trip. 2. What made you choose this particular tour to India? 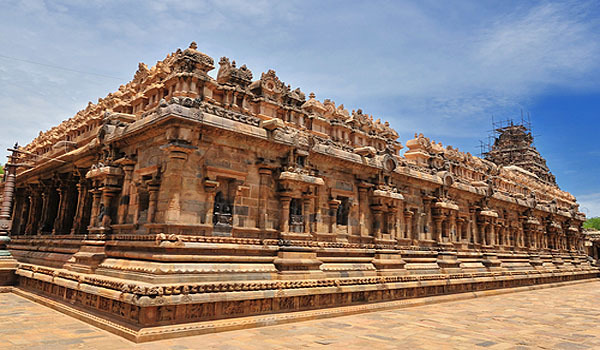 Why did visiting South India appeal? David’s father was born in Chennai and we had never visited this part of India before, plus we have always enjoyed viewing wildlife. So the combination of the three made perfect sense when we organized this itinerary. 3. 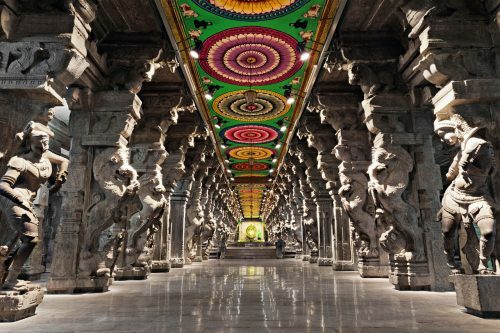 You started your trip visiting the wonderfully ornate temples of Madurai where you saw the Aarti ceremony – can you tell us a little bit about the ceremony and the Meenakshi Temple? Unfortunately, we had very little sleep due to delayed flight, so we decided just to watch the procession rather than get involved with the whole ceremony. Meenakshi Temple was vast, extremely colorful and highly ornate, the tour of one of the most beautiful temples of Madurai was fascinating. Because it is a working temple we got to witness a little slice of life beyond the complexities of Hinduism, we were shown a ninth-month pregnancy meeting between two families to explore the possibilities of marriage, which, unfortunately, appeared not to be going well. 4. 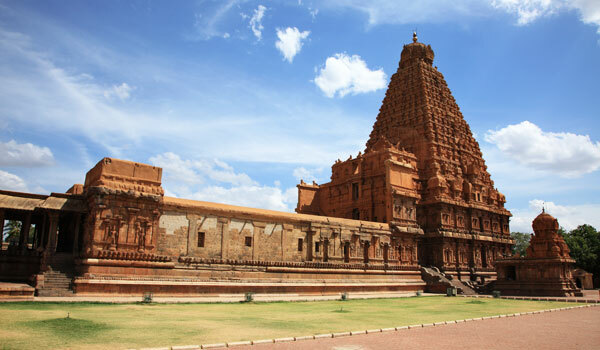 Following Madurai you visited Tiruchirapalli and then the temples of Thanjavur-how did they differ from what you saw at the temples of Madurai? 5. 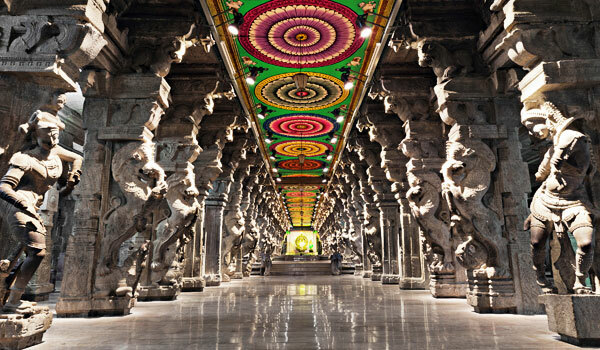 All in all which of the temples and temple complexes did you find most impressive, and why? Our favorites were in no particular order – Darasuram (below), which was small, beautiful, peaceful and beautifully carved; Thanjavur (see above) and Mamallapuram, so beautiful again and in a wonderful setting. 6. What were your impressions of the Auroville Township? Did you interact with any of the residents? We arrived at Auroville after our tour of Puducherry having toured the Sri Aurobinder Ashram, which, while very interesting, we found a bit too much like a cult. 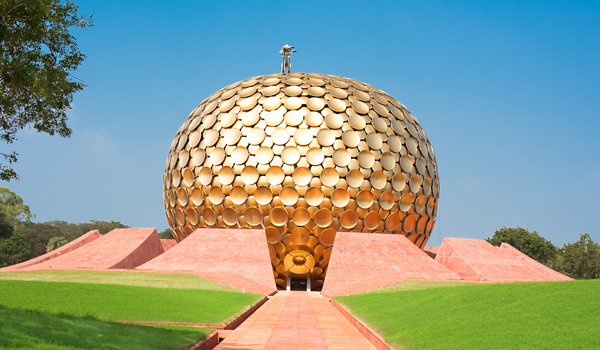 We got a similar feeling about Auroville – for example, the giant gold ball seemed too extravagant for the place in view of its stated aims. We did not interact meaningfully with the residents although we did note the rather commercialized shops. But it was interesting. 7. What was the best meal that you had on your trip? 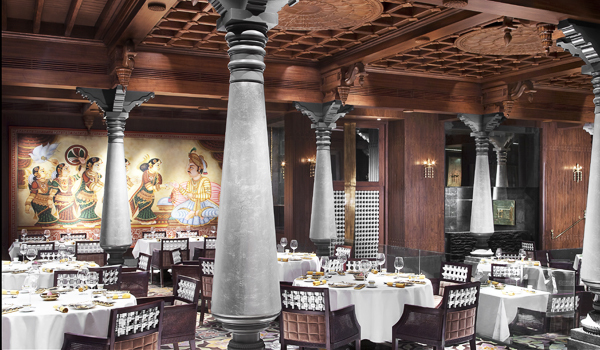 How would you rate the overall quality of dining while visiting South India? Generally we ate very well but the food was ‘hotter’ than we had experienced before so had to be a bit cautious! There was no single best meal but we would note the two dinners at Maison Perumal, which were delicious and followed by a great conversation with the team running it! We had a great dinner in the Taj hotel in Chennai – our first meeting with a chutney trolley bigger than a cheese trolley here! We had a great dinner in the Taj hotel in Bengaluru when we tried their vegetarian taster menu. We had a very good lunch at another hotel in Thanjavur when we hosted our guide and driver, a complete lunch cost only 100 rupees a head and was so simple but extremely good! Finally, the best breakfast was at Coorg but unfortunately I was ill there and so didn’t eat any dinner there – I suspect dinner would have been great as Isabel [a cookery teacher] was giving demos of the signature dish and a guided tour of the kitchen by the chef! 8. You spent a couple of days in cities Chennai and Bengaluru, followed by Mysore. 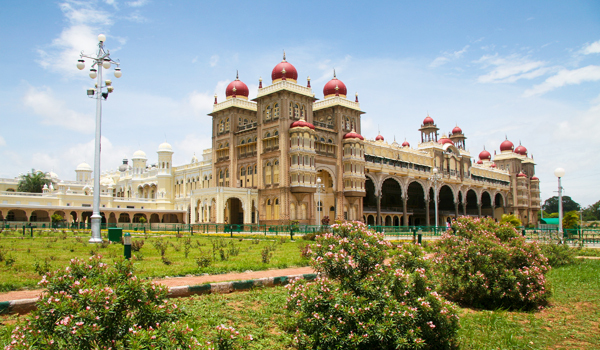 Mysore conjures up images of the romance of India – what were your impressions of the city? And how did it compare to the other two? Mysore was a city we enjoyed and we really clicked with our guide Rahda. It is certainly more beautiful than the big cities of Chennai and Bengaluru. Its Chamundi hill and trees and Maharajahs palace all give it charm, as does the lovely market. The military history including the Duke of Wellington is also interesting. 9. Towards the end of the trip you spent a couple of days looking at the elephants of Nagarhole National Park. Which animals did you spot? Did you go on a boat safari? We did not go on a boat safari as there was very little water in the river. As a result we had safaris in an open topped vehicle, which I think was much better as our great guide could take us where he wanted to go. We saw a lot including monkeys, spotted deer, sambar deer, elephants, peacocks, a few birds, giant Malabar squirrel and three tigers. 10. You stayed in some lovely hotels during your trip. Which stood out for you and why? 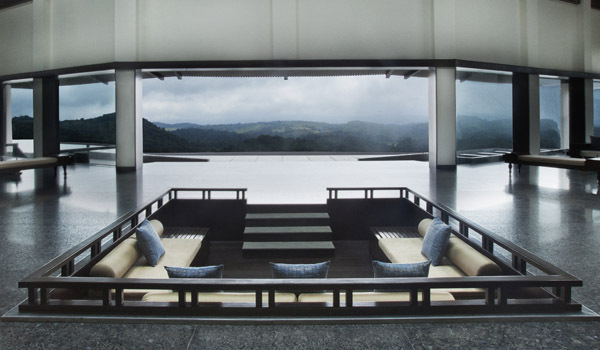 The best hotel was Coorg Taj – the setting, design and facilities were magical. The staff were so lovely and so helpful when I was ill – a chest infection not gastro-enteritis! The Maison Perumal was in its way just as lovely but very different. I supposed both stood out for being so personal. 11. Tell us about your experience of traveling with Greaves India. Greaves provide and expert, specialized vacation when you always feel well cared for! They encourage clients to have input into the makeup of the tour and things go like clockwork. If a problem occurs they sort it out – this happened on our Kerala trip at one hotel. 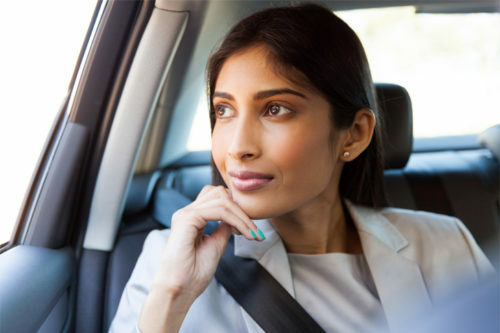 Our drivers have always been supportive, good-humored and interesting. Deepak stood out among them four years ago. We have so many special memories of India and Indians! Inspired? Explore the Saffron & Sandalwood Itinerary for yourself.